I am in the EAST LANCASHIRE GROUP Of The ALPINE GARDEN SOCIETY (AGS) it’s definitely the best ‘Club’ I have been a member, the group is very active full of enthusiastic participating members and a credit all. I joined the group to best understand plants in miniature for Kusomono. At the last meeting we enjoyed a practical talk with photographs and video by Member John Dower from Frodsham. John has recently been appointed a Trustee of the AGS and is one of the countries leading exponents of the development and showing of miniature gardens. 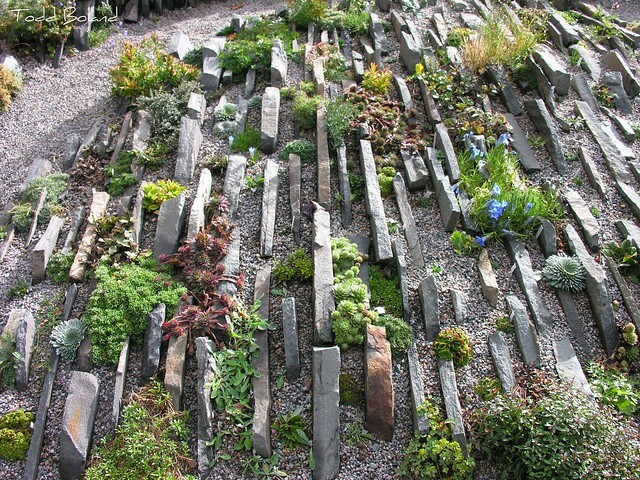 The gardens have a maximum size of 36 cm for showing, although the principles outlined apply equally to any trough, sink, raised bed or other display of alpines. 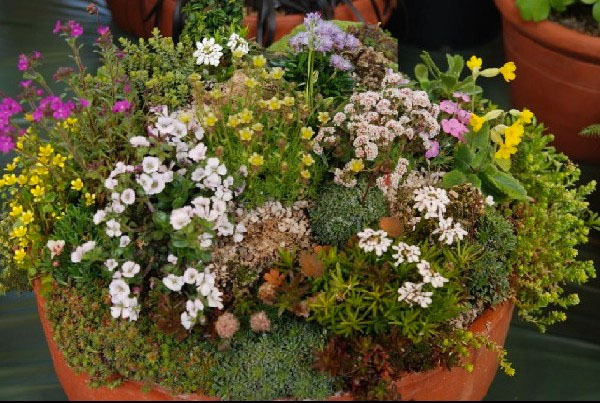 John threw down the gauntlet asking members to create their own miniature gardens and present them at the next annual show… this is my effort so far! I have chosen to make a miniature crevice garden, I have used limestone and a bonsai pot. After a couple of attempts the stones simply were not secure, as I need ‘height’ and gaps between for planting. The only solution was to bind them together with waterproof cement, but still retaining enough room in the pot for compost and drainage. I made an ‘icing bag’ out of plastic shopping bag to help push the cement into the cracks, some gaps in the stone were left for drainage. Fill with soil mixture (John Innes No.2 with crushed Pumice) using a chop stick to force soil into the crevices. Next step is the hardest bit choosing plants of the correct scale and colours. Actually a Hawthorn Dan… if I am to ‘replicate in miniature my local landscape. Great! I’m looking forward to the final planting!